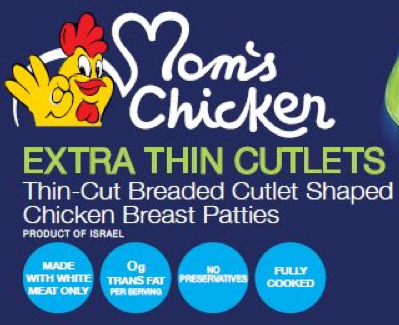 NUVA USA, a Fairfield, N.J., establishment is recalling approximately 8,316 pounds of Mom’s Chicken Extra Thin Cutlets product due to possible contamination with Listeria monocytogenes (Lm), the U.S. Department of Agriculture’s Food Safety and Inspection Service (FSIS) announced today. Bags bear the Israeli establishment number “209” within the Israeli mark of inspection. The product’s expiration date is February 18, 2015, and bears the following UPC number on the packaging: 843426005866. Consumption of food contaminated with Lm can cause listeriosis, a serious infection that primarily affects older adults, persons with weakened immune systems, and pregnant women and their newborns. Less commonly, persons outside these risk groups are affected. Listeriosis can cause fever, muscle aches, headache, stiff neck, confusion, loss of balance and convulsions sometimes preceded by diarrhea or other gastrointestinal symptoms. An invasive infection spreads beyond the gastrointestinal tract. In pregnant women, the infection can cause miscarriages, stillbirths, premature delivery or life-threatening infection of the newborn. In addition, serious and sometimes fatal infections in older adults and persons with weakened immune systems. Listeriosis is treated with antibiotics. Persons in the higher-risk categories who experience flu-like symptoms within two months after eating contaminated food should seek medical care and tell the health care provider about eating the contaminated food. Media and consumers with questions regarding the recall can contact Customer Service at 1-844- GOTNUVA (1-844-468-6882). Consumers with food safety questions can "Ask Karen," the FSIS virtual representative available 24 hours a day at AskKaren.gov or via smartphone at m.askkaren.gov. The toll-free USDA Meat and Poultry Hotline 1-888-MPHotline (1-888-674-6854) is available in English and Spanish and can be reached from l0 a.m. to 4 p.m. (Eastern Time) Monday through Friday. Recorded food safety messages are available 24 hours a day. The online Electronic Consumer Complaint Monitoring System can be accessed 24 hours a day at: http://www.fsis.usda.gov/reportproblem.